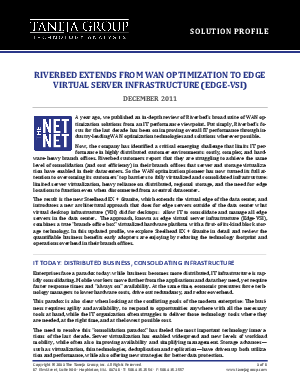 Enterprises face a paradox today: while business becomes more distributed, IT infrastructure is rapidly consolidating. At the same time technology managers are tasked with lowering hardware costs, drive out redundancy, and reduce overhead. In this report, Taneja Group explores how Riverbed Technology has identified a way to address this paradox by tackling the performance issues in branch offices. The new Steelhead EX + Granite appliance combines a "branch-office box" virtualized hardware platform with a first-of-its-kind block storage technology to allow consolidation of edge storage, servers, and applications to the data center. Download the report to learn how your organization can benefit from reducing the technology footprint and operations overhead in branch offices.